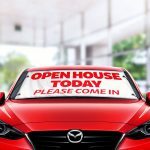 A bold and attractive open house sign to generate interest for your event, this Open House Windshield Banner is also incredibly easy to set up and take down. Open House Windshield Banners are available in Red or Blue, and with or without an arrow, which can point left or right. 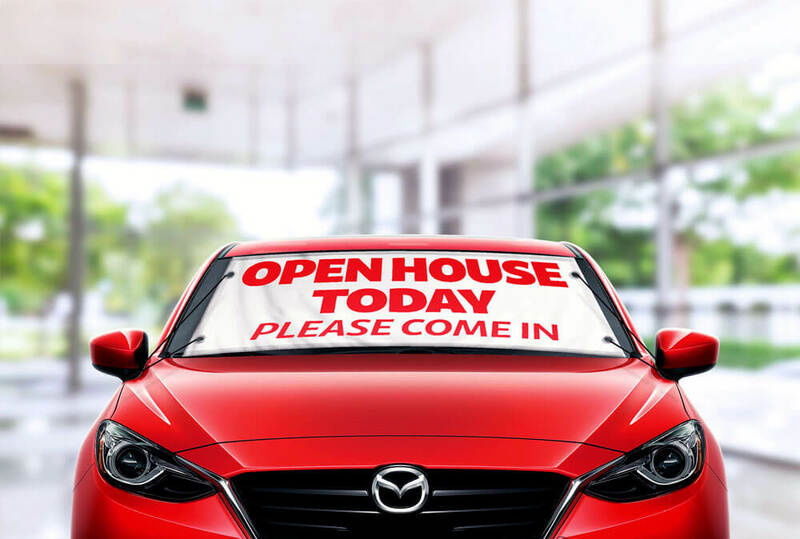 If you want to generate more interest in your open house, an Open House Windshield Banner is the way to do so. The large, bold banners complete with an arrow if required will show visitors the way to your event so no one will miss it. 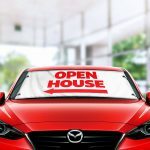 Easy to attach to any vehicle, the banners are also durable and weatherproof so they will keep advertising your event no matter what the weather does, making them a great alternative option for an open house sign. These banners make advertising your open house easy by ensuring no one misses them. We provide a range of other products for your open house. Take a look at our Custom Windshield Banners, Custom Real Estate Flags, and Mini 3D Real Estate Flags for more options. Get your banner order sent out to you in between 1 and 5 days no matter where you live. As soon as your order is complete, we’ll send it out for delivery.